The Boxer is a lively and energetic breed that is known for its very distinct appearance. Their signature squashed face and naturally floppy ears make them a sought-after breed among dog enthusiasts. The medium-sized dog was initially developed in Germany during the 19th century. Their muscular bodies and energetic attitudes made them the perfect hunting companion. While faster and agiler dog breeds were created later on in history, Boxers continued to faithfully serve humans in many ways. They performed military work during the first World War, acted as messenger dogs, and became a popular guard dog. Today, modern Boxers are usually just another member of the family. They're intensely loyal and are patient with young children. Even still, they have that playful attitude, unbridled energy, and social aptitude that made them popular. Whether you already own a Boxer or you're thinking about adopting a new pup, supplying them with a healthy diet is key to helping them live a long and fulfilling life. They need a high-quality diet to remain physically fit and avoid common health concerns. To ensure that you choose kibble that's suitable for your pooch, you need to know what to look for. How Much Food Does a Boxer Need Each Day? This breed will need a significant amount of kibble each day to stay healthy. They're active dogs that typically spend their day running around and getting a lot of exercises. As a result, they'll need a lot of fuel. With that being said, the exact number will depend entirely on your dog's unique situation. While many manufacturers include a recommended daily serving on their packaging material, these numbers will vary based on your dog's age, activity level, and any health issues that they're experiencing. It's important that you keep an eye on your dog's health throughout their life and adjust accordingly. Food intake is measured in calories instead of physical volume. This is because the exact calorie count of kibble differs from manufacturer to manufacturer. Looking at the food in terms of calories can also help you choose a higher quality food. Cheaper foods tend to have fewer calories and more filler, thus requiring you to feed your pooch higher servings to achieve the same nutritional value as denser recipes. Typically, an adult Boxer will need in the ballpark of 20 to 30 calories per pounds each day. Adults have a relatively wide weight range. Smaller females can weigh as little as 50 pounds while muscular males can tip the scale to 75. An average adult boxer that weighs in at around 65 pounds may need approximately 1,625 calories every day. To find the perfect amount, you should pay attention to your dog's activity levels. If your dog is very active or spends their day working, it's a good idea to bump that number up to the higher end of the spectrum. These dogs should be getting the full 30 calories per pound of food. However, less active dogs won't use up all that fuel, so they should be receiving much less. It's recommended that you keep track of your dog's weight and lifestyle in addition to consulting with your vet. Puppies will require more food per pound of body weight. This extra boost in calories help to kickstart the development cycle and will ensure that their muscles develop properly as they make their way to adulthood. Playful puppies will need about 55 calories per pound each day once they're weaned off their mother's milk. A 10-pound puppy should be eating about 550 calories throughout the day to stay healthy. In addition to more calories, they'll need nutritionally-dense food as well. Up to 45% of the formula should be made from animal-based proteins that are chock-full of muscle-building amino acids. It's crucial to keep track of your dog's health during their senior years. While many older dogs still remain active, there will come a time when you start to notice that your canine companion would much rather spend their days lounging around. When that starts to happen, you need to be strategic about their diet plan to keep them healthy. The same amount of food that they ate as adults may now lead to weight gain. It's important that you decrease their calorie count while still giving them the fuel they need to thrive. 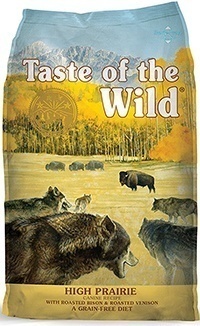 Taste of the Wild dry dog foods are known for their high-quality ingredients. Its designed to mimic the diet of wild canines, so you're getting all the protein that your dog will need to stay healthy. This particular formula utilizes buffalo, lamb meal, chicken meal, beef, and roasted bison as the main protein sources. This wide variety of meat sources offers a complete amino acid profile. In total, protein makes up 32% of this recipe. It also utilizes complex carbohydrates like sweet potatoes and peas. Healthy probiotics and a range of antioxidant-rich plant-based ingredients round off this recipe to provide your pup with the balanced diet they need. 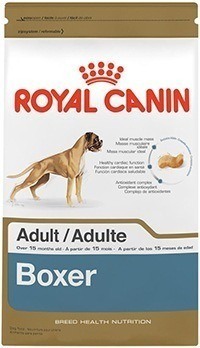 From Royal Canin is this dry dog food that's specifically formulated to meet the dietary needs of the Boxer breed. It has optimal levels of protein and fat to help your dog maintain their muscular build. 24% of the recipe is protein and 18% is fat. The protein sources include ingredients like pork meal. It also contains heart-healthy ingredients like Taurine, EPA, and DHA. The kibble itself is designed to help your dog avoid stomach issues. It accommodates the unique jaw of the Boxer to promote chewing. 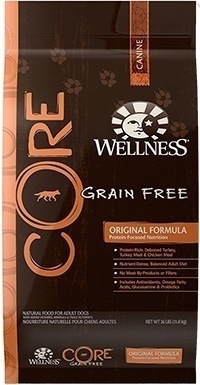 This grain-free kibble from Wellness Core is completely natural. It's free of any unwanted fillers like corn, wheat, or soy. You won't find any meat byproducts or chemical additives either. Instead, this kibble is filled with positive ingredients. The main protein sources are deboned turkey, turkey meal, chicken meal, and chicken liver. For all the vitamins and nutrients your dog will ever need, this dog food contains a wide range of plant-based ingredients. These include carrots, sweet potatoes, kale, blueberries, and so much more. 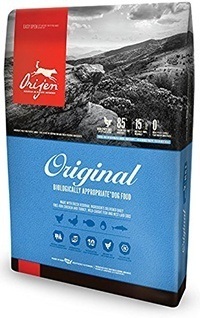 The Orijen dry dog food is a relatively simple recipe that has only the essentials. It's made up of an impressive 38% protein. A wide range of protein sources is included. They include many species of fish as well as deboned turkey and chicken. High-quality complex carbohydrates like whole green peas and lentils are also thrown in. For digestive health, the dog food contains about 4% fiber with ingredients like collard greens and mustard. There's even a healthy dose of chondroitin and glucosamine for joint health. 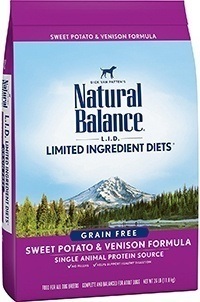 This option from Natural Balance has limited ingredients so that you always know what's going into your dog's body. The recipe has all the stuff that your dog needs to stay healthy without any of the unnecessary extras. It's completely grain-free and has no artificial additives. Instead, you'll find beneficial ingredients like sweet potatoes, venison meat, salmon oil, and much more. In total, protein makes up 20% of the recipe. Per 8-ounce cup, the kibble contains approximately 370 calories. 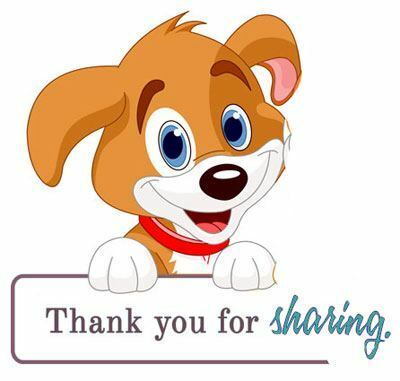 You can meet all of your dog's dietary needs without having to feed them too much. Boxers should be supplied with smaller meals throughout the day. Their daily calorie requirements need to be spread out into multiple smaller meals. At the very least, they should be fed once in the morning and once in the evening. If it's possible, three meals are even better. Multiple feeding sessions can help to avoid potentially-dangerous bloating issues and provide them with a constant supply of energy. It's also important that you let your dog digest their food prior to any major activity. Let them rest for an hour or two before you take them for a walk. Too much activity shortly after eating can increase the risk of experiencing bloat and lead to significant stomach upsets. The same goes for going to sleep. Food should already be making its way through the digestive tract before your dog calls it a night. You should always take a look at the ingredients list of a potential dog food prior to purchasing it. Boxers are prone to developing allergies, so you need to find a recipe that's filled with beneficial nutrients and free of potentially-harmful ones. These dogs need a diet with plenty of vitamins, nutrients, and minerals to stay healthy. With most manufacturers, the ingredients that are listed first are the most prevalent. Here are some good things to look for. A high-quality protein source should always be listed first. Animal-based ingredients like chicken, beef, and fish are best. In total, your Boxer should be eating food that's made up of at least 20% protein. The higher that protein content is, the better it is for your dog. Protein sources contain essential amino acids. They act as the building blocks for muscles. Look out for protein sources that are easy to understand and identify. It's recommended that you steer clear of any animal byproducts or mystery meats that aren't clearly labeled. Meals are also acceptable as long as the type of meat used is displayed. Meat meals from questionable sources should be avoided. Contrary to popular belief, not all fats are bad. In fact, they're a great addition to dog food in moderation. Natural fat from the meat source is a great source of energy for your dog. Furthermore, fat adds a lot of flavor to the food. This can make it more appealing for your pooch so that you don't have to use any additives to get them to eat. Boxers do well on a diet that consists of low to moderate fat. They're already pretty energetic, so they don't need much. Look out for healthy sources of fat like salmon or flaxseed oil. These ingredients contain omega fatty acids that could benefit your dog's skin and coat. These fats will keep the skin supple and help you avoid skin irritations. They can also enhance your dog's overall heart health by improving their circulatory system. Carbohydrates are found in all dog foods, but not all sources are the same in quality. Many cheaper options utilize corn, wheat, or soy. These don't do anything for your dog and can actually irritate allergies. Additionally, dogs aren't meant to digest these foods. They can do a lot of harm to your pup's digestive tract, resulting in stomach upsets, vomiting, and diarrhea. These types of simple carbohydrates are used more as fillers than anything else to keep the costs down. The best source of carbohydrates are things like sweet potatoes, peas, and oats. They're considered to be complex carbohydrates. They take much longer to break down into glucose for absorption by the body. This slow process lets your pup maintain their energy levels throughout the day and prevents unwanted energy crashes. While dogs are undoubtedly carnivores through and through, they can benefit from the vitamins and minerals in vegetables. Many manufacturers throw ingredients like carrots, apples, and leafy greens into the mix. They offer a healthy dose of Vitamins A, C, and D. Carrots are filled with Beta Carotene, which can enhance ocular health. Many ingredients like blueberries and spinach also contain antioxidants. Antioxidants help to fight off free radicals. A daily dose can prevent cancer and other dangerous diseases. 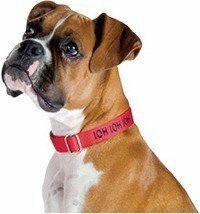 Probiotic ingredients like oats and beet pulp can do wonders on for your Boxer's digestive health. As mentioned earlier, these dogs are prone to suffering from bloat and other stomach sensitivities. Probiotics introduce healthy organisms into your dog's gut. They can improve the digestive process over time. Many leafy greens also act as an extra source of fiber. Fiber will clean out your dog's system and keep them regular. 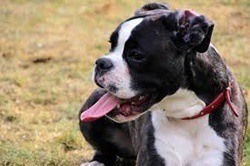 Boxers are susceptible to a number of health issues due to their build and genetics. These issues can be experienced as your dog gets older. A healthy diet can be used to combat these risks or alleviate symptoms. A lifetime of running around and jumping can lead to significant joint problems. Arthritis occurs when the joints become damaged. Hip dysplasia is a genetic condition that causes the hip joints to become malformed. Both issues can cause your dog pain and prevent them from living an active lifestyle. Luckily, many dog food manufacturers include ingredients that can support your dog's joints. These include glucosamine, chondroitin, and calcium. Bloat is a life-threatening condition that causes a undue pressure on the organs. It can prevent your dog from breathing, restrict blood flow, and tear the stomach lining. It happens when dogs eat too fast and take in too much air during the process. The stomach will inflate and twist, making it impossible to alleviate without medical intervention. The best way to avoid bloat, also referred to as Gastric Dilation-Volvulus, from occurring is to split up their meals. This will prevent even the most voracious eater from gobbling up too much food too fast.